I hear this all the time and what I once heard spoken as a given fact is more often being stated in sarcasm or with irony. But it’s true, aint it? Oh, you sad misinformed world. There’s a great deal of useful, wonderful info on the web, but just because you read it one place don’t make it so. Double check the info and double check the source. 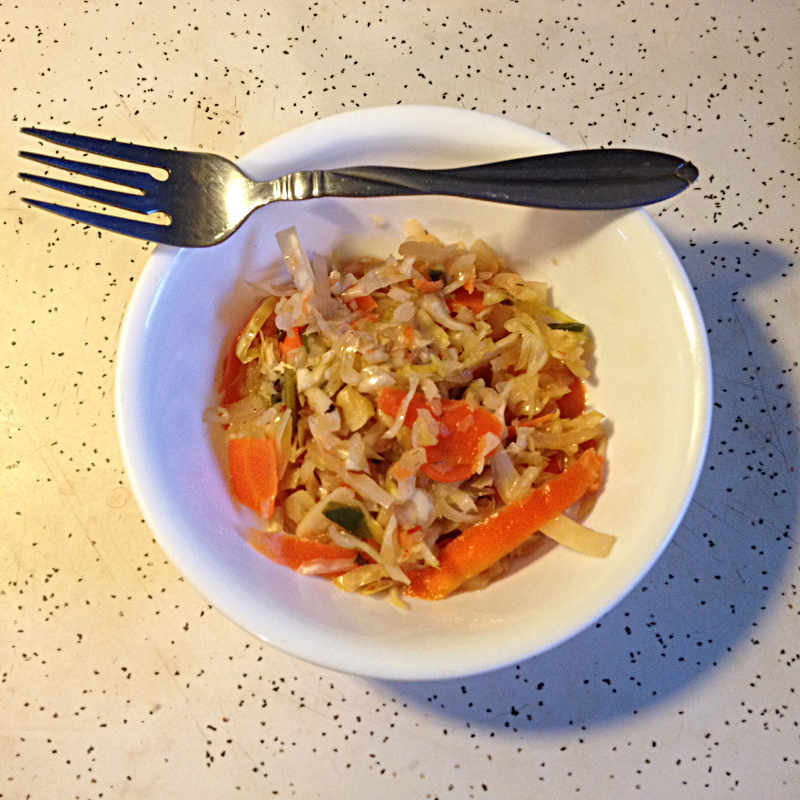 A largish serving of a rather spicy sauerkraut with kale, carrots, green onions, peppercorns, and, of course, cabbage. Preparation of fermented foods is dead simple! I LIKE fermented foods – really, a lot of ’em taste good. I’m sitting here wishing I wasn’t limited to how much fermented food I could eat in a day. You really should limit how much fermented food you eat in a day. I have fewer stomach problems since I’m eating fermented food daily. I have more energy since I’m eating fermented food daily. It is relatively inexpensive to prepare fermented foods. I’m good at making fermented foods! Regarding that last statement… yeah… it’s true. Jeanette’s been eating my multi-veg kraut by the bowl full! And she’s honest enough that if she doesn’t like it (the Kvass was too salty) she won’t eat it! I’ve got a second, lower sodium batch of kvass down, a second, plainer version of kraut down, a nice looking batch of kimchi started, a sourdough starter in the fridge, a healthy kefir in a quart jar (we started in a pint), and only a couple more days until my kombucha is ready. But, what about the dessert part? In the title, you said dessert?!? Turns out that sauerkraut isn’t just for topping hot dogs, serving alongside ‘wursts, or force feeding Weird Al Yankovich for 26 1/2 years (too much?). You can make desserts with it, too! 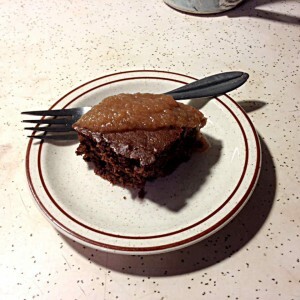 Sauerkraut cake topped with a little home made pear sauce… tastes like more! Sift all dry ingredients together. Cream sugar, butter and vanilla. Add honey, beat well. Add eggs one at a time. Pour into greased pan or pans. Bake 30 to 40 minutes until cake tests done. Frost. Delish! I mean, I just finished my third piece in a row and I’m thinking about a fourth… Jeanette even had 2!